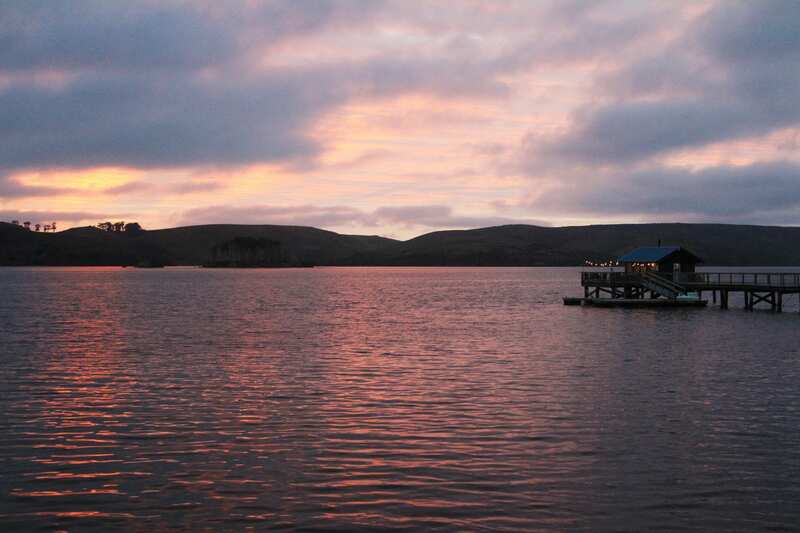 In late winter, I watched birds skitter across the tranquil waters of Tomales Bay while walking the pier at Nick’s Cove & Cottages. I turned to see a man scurrying behind me carrying a covered tray and two beers. It was a cool, cloudy afternoon and no one was seated at the outdoor tables on the pier. I was curious to know where he was headed. Instead of turning toward the tables, he opened the door to an old wooden boat shack at the end of the pier. Judging from its weathered appearance, I had assumed that the shack was closed for the season. But when the man opened the door, I caught a glimpse of a roaring fire and someone seated inside. I opened the door to the shack and was struck by its warmth and charm. It was like stepping into a bygone era. Strains of jazz music floated in the air. 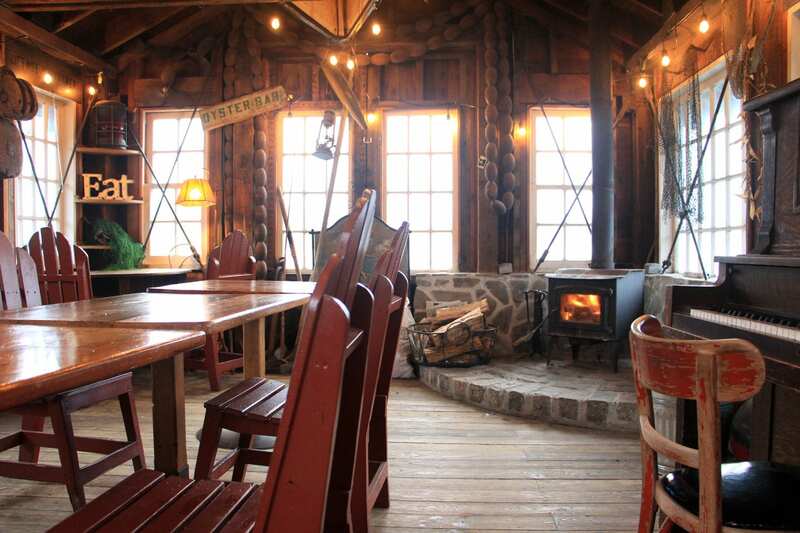 In the far corner, a cozy fire was burning in a wood stove. The shack was aglow with string lights and warm tinted lamps. The space was decorated with vintage signs, lanterns, and fishing paraphernalia. An old wooden oar boat was tucked into the rafters overhead. An upright piano stood to one side. 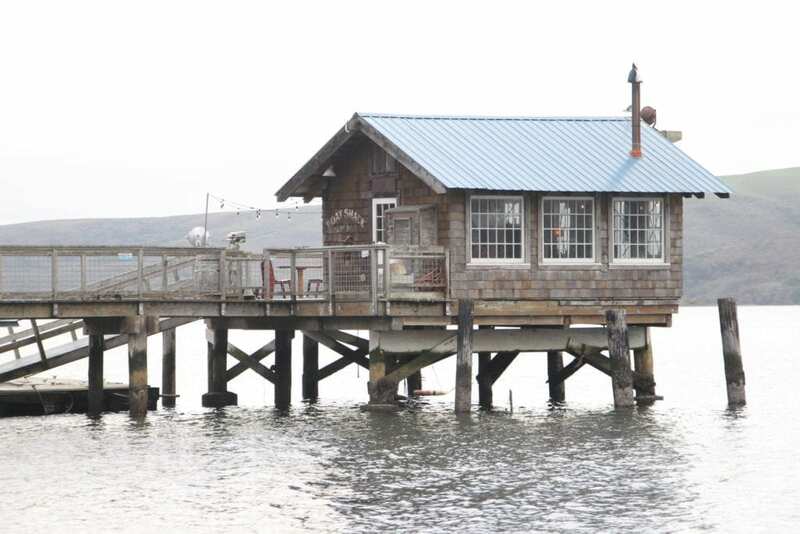 The shack was wrapped in windows overlooking Tomales Bay and the rolling hills of the Point Reyes Peninsula. The couple at the back table was sharing a plate of oysters. The woman called out to me. “Isn’t this magical?” she asked. I had to agree. 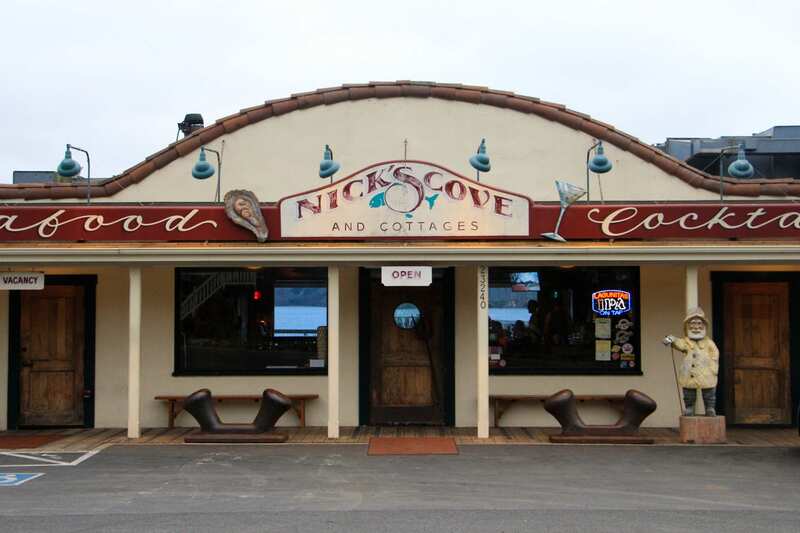 Nick’s Cove is just an hour and a half drive from San Francisco along a lonely, winding stretch of Highway 1, but the relative remoteness combined with the serene, historic setting make it feel as though it’s a world away. 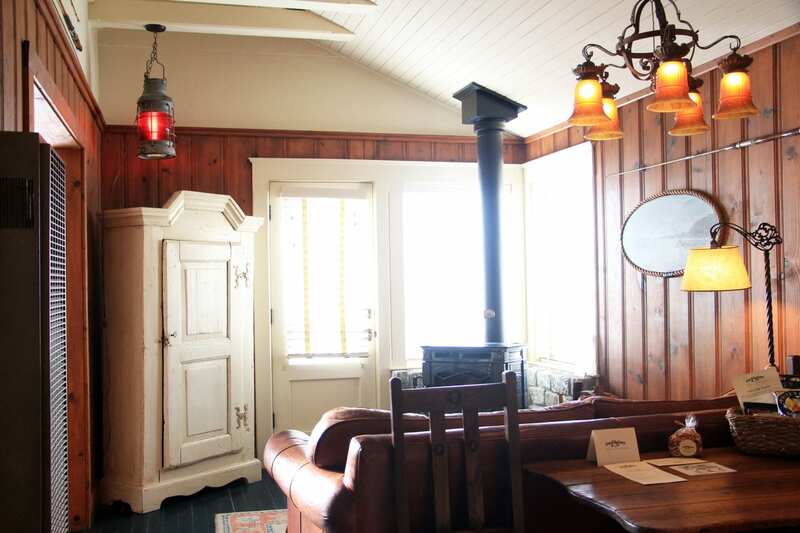 In addition to its restaurant, pier, and romantic boat shack, Nick’s Cove features a collection of meticulously-restored 1930’s-era bungalows nestled along the water’s edge, all with wood-burning stoves, handsome antiques, and luxurious amenities. I stayed in one of the cottages—Al’s Cottage—which is built on wood pilings on the beach. 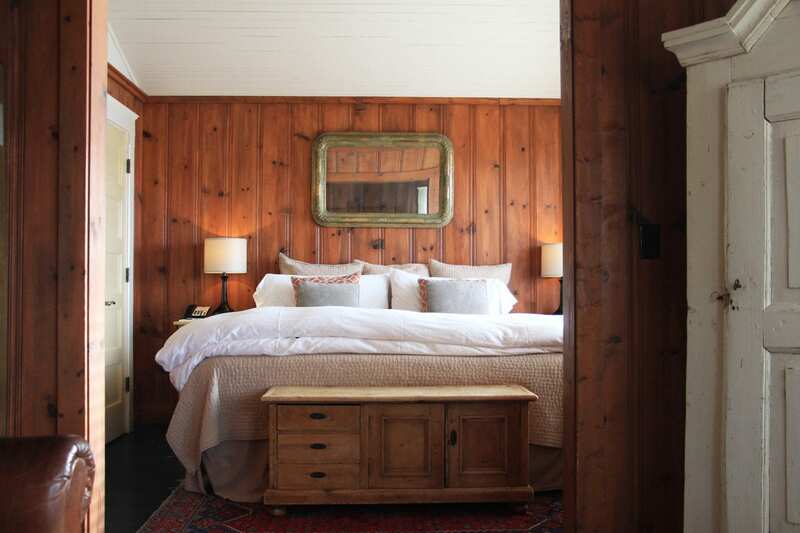 Imbued with a nostalgic charm, the cottage is decorated with warm-hued rugs, glowing lamps, and vintage fishing rods and photographs. A luxuriously comfortable king bed is draped in silky smooth sheets and a down duvet. 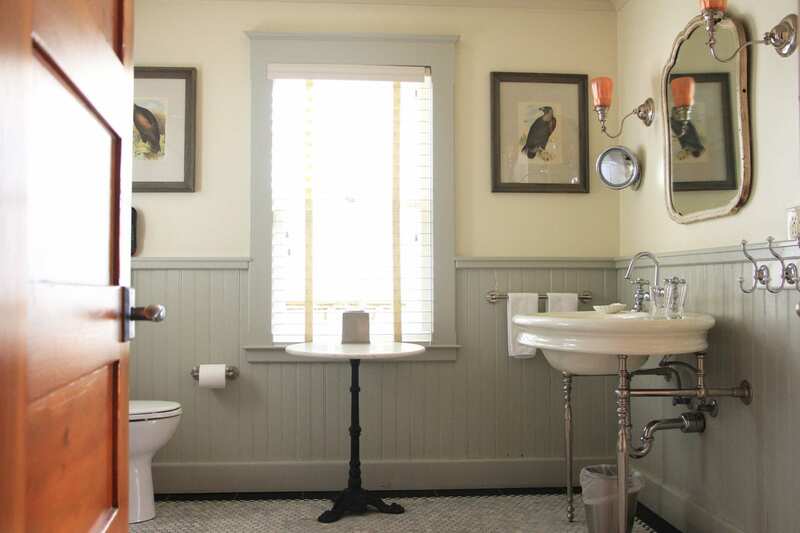 A spacious bath features heated tile floors and a reclining claw foot tub. A separate living and dining area includes a wood stove and an honor bar with a variety of spirits, mixers, wine, and beer. Just before sunset, the sun peaked out from behind the clouds and shimmered off the water onto the pine walls of the cottage. I stepped out onto the private deck to watch the sun sink behind the fog-shrouded hills of the peninsula across the bay. 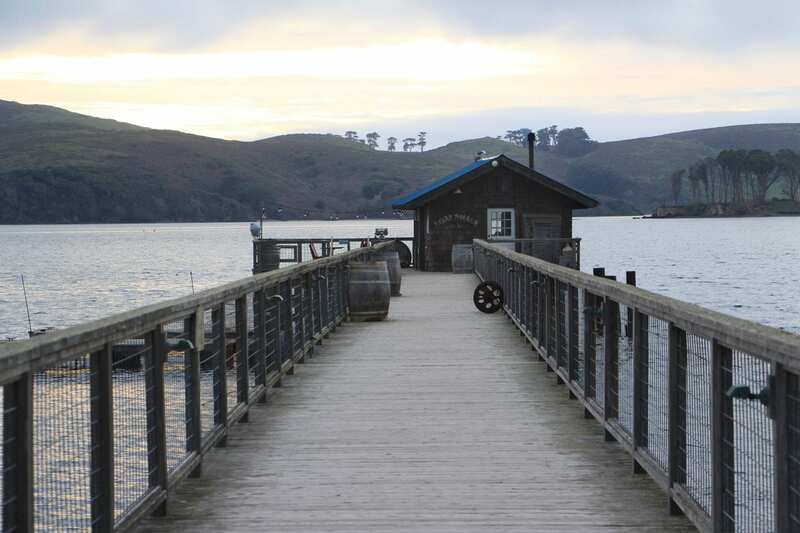 I had dinner next door at Nick’s Cove Restaurant & Oyster Bar, which has been serving fresh seafood and oysters from Tomales Bay and local waters since the 1930s. With its restored mahogany bar, rock fireplace and game trophies, it has the feel of an upscale hunting lodge. Most of the leafy greens, vegetables, and herbs featured on the menu are grown just across the road at The Croft, the restaurant’s own farm and garden. I enjoyed roasted cauliflower with greens and pancetta as first course followed by wood-fired salmon with a divine, buttery texture served with coconut-infused purple sticky rice and baby bok choy. Back at the cottage, I lit a fire in the wood stove and curled up on the leather couch with a cup of tea and a guide book for hikes along the Point Reyes National Seashore. I was planning to go for a hike on the peninsula the next day. I awoke to the sound of the water gently lapping at the beach beneath the cottage. I stepped out on the deck to find a snowy egret slowing making its way through the shallow waters with long, graceful steps. At Miller’s Boat Landing beyond the pier, a pair of kayakers were just preparing to launch. A continental breakfast—with fresh fruit, fresh pastries, freshly squeezed juice and coffee or tea—was delivered to the cottage on a tray with a copy of the San Francisco Chronicle. Afterwards, I drove south on Highway 1 to Point Reyes Station and then turned to follow the roads up the peninsula to the historic Pierce Point Ranch and the Tomales Point trailhead. The remote, 9.4 mile trail winds through the Tule Elk Reserve to the northernmost tip of the peninsula with breathtaking views. 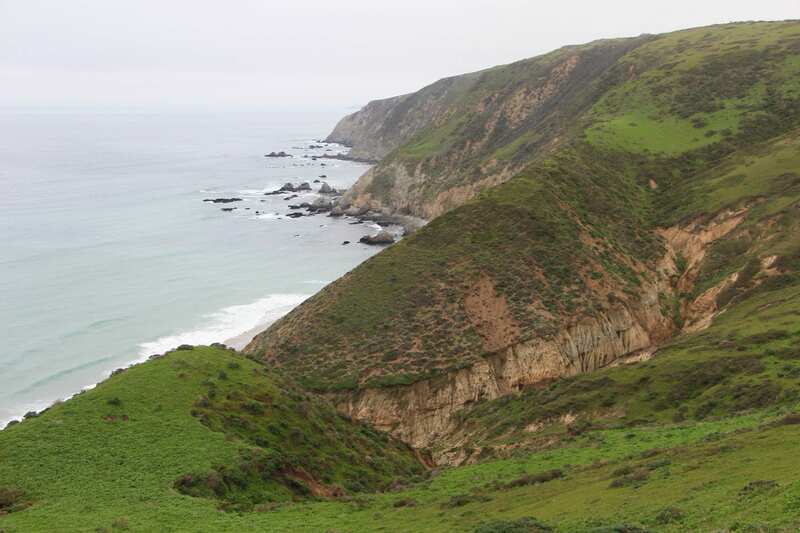 Less than a mile into the hike, the peninsula narrowed and the trail began to follow the ridgeline with the placid waters of Tomales Bay on one side and the dramatic cliffs and crashing waves of the Pacific Ocean on the other. 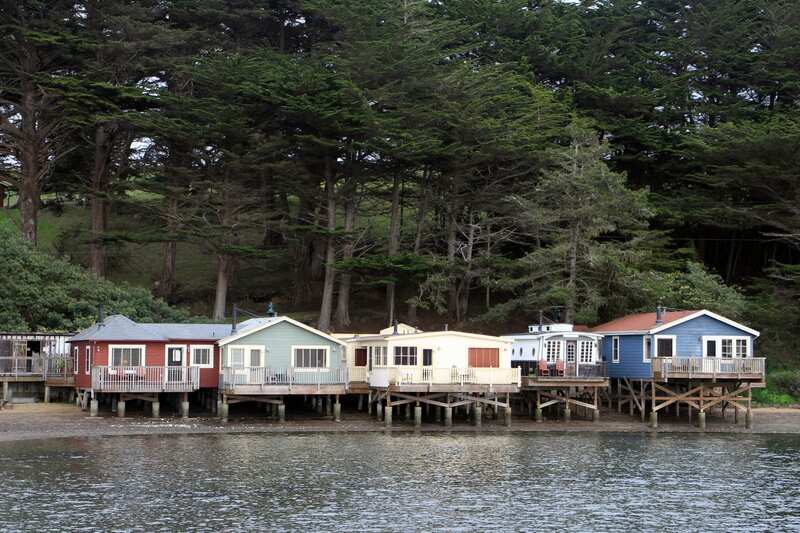 I caught sight of a herd of Tule Elk grazing on the hillside leading down to the bay, and beyond that, I could see a remote outpost across the water: the pier and cottages of Nick’s Cove.